EVERY WordPress Site Needs To Satisfy Google! If You’re Struggling to Avoid Google Slaps, Get Your Site Ranked Higher, and Get More Conversions, then Listen Up! You Can Turn Any Website Into a Google Approved Magnet! Save Time, Money & Possible Lawsuits! Douglas Yuschalk here and I have “The Must Have” WordPress Plugin for you! I’m going to get straight to the point here; with all of the recent algorithm updates (Panda, Phantom, Rank Brain, Zombi, and more to come) , you must comply with Google and all the other search engines with clear signals of your Website’s credibility and authenticity. You still want to make sure your Site ranks as high as possible, outranks your competition, and most importantly; that all of your efforts will provide you with authentic organic results. Google says there are 120 Trillion pages online and 60% of those are duplicates. Those duplicate pages are constantly being de-indexed and subsequently completely banned. It used to be so, so easy – you could just slap up a Website or an Affiliate Site, load up your keywords, phrases, long tails, and watch the Search Engines start to rank you! But Website Ranking just isn’t that easy anymore…..
You can no longer get away with just a basic churn and burn Website and marginal marketing efforts. Google is more sophisticated than ever before. Consumers are more sophisticated than ever before. In fact, more new domain extensions are soon to be released that will cater to both organic growth and the needs of businesses that want their own branded domain….Even More Competition! The trust factor is almost insurmountable already! YMYL Plugin adds a Complete Footer on your Website w/14 VITAL Information Pages & an Auto-Updating Copyright Year w/Customizable Links. Satisfy Google & Save Time! As marketers, we’re constantly thinking about our company’s website and coming up with ways to improve it. Questions about it keep us up at night. 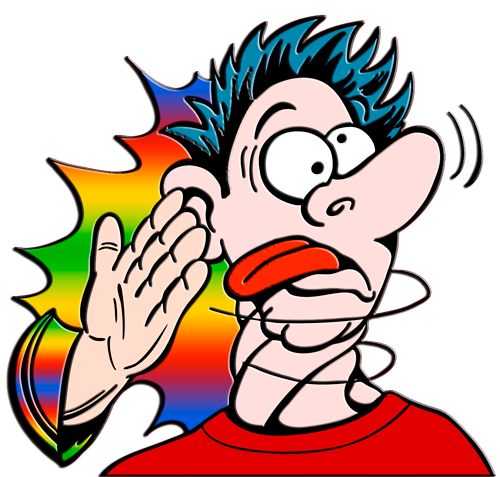 Could we get slapped by Google?Blackhat, Greyhat or Whitehat SEO? Could we improve the layout? Do we need a clearer call-to-action on the homepage? Do we need a responsive site? Besides quelling your daily concerns, you also need to be aware of the most recent changes in Search Engine Algorithms. And that’s a lot to worry about … especially when your time is spread thin among a ton of other projects. So to give you a leg up in your Website Design Marketing activities, we’ve developed one of the most powerful WordPress Plugins to save you TONS of time and ensure you won’t be SLAPPED by Google for missing important information (Copyright, Sitemap, Robots text file, Contacts, Location, Disclaimers, FTC Disclaimer, and all other VITAL Information) or forgetting to update your Copyright Year. Google rewards Websites that follow their guidelines! Let me say that again…”Google Rewards Websites That Follow Their Guidelines”! 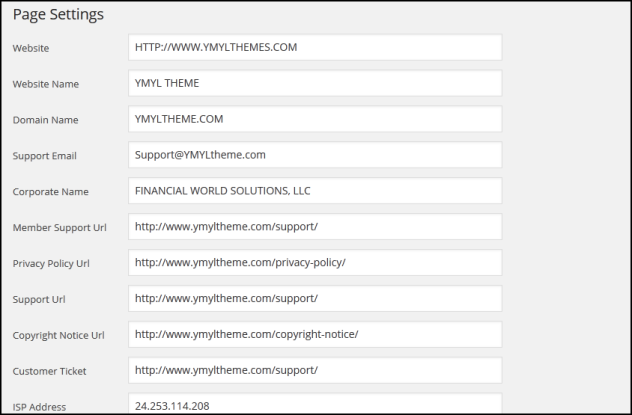 The YMYL Premium Footer Plugin! 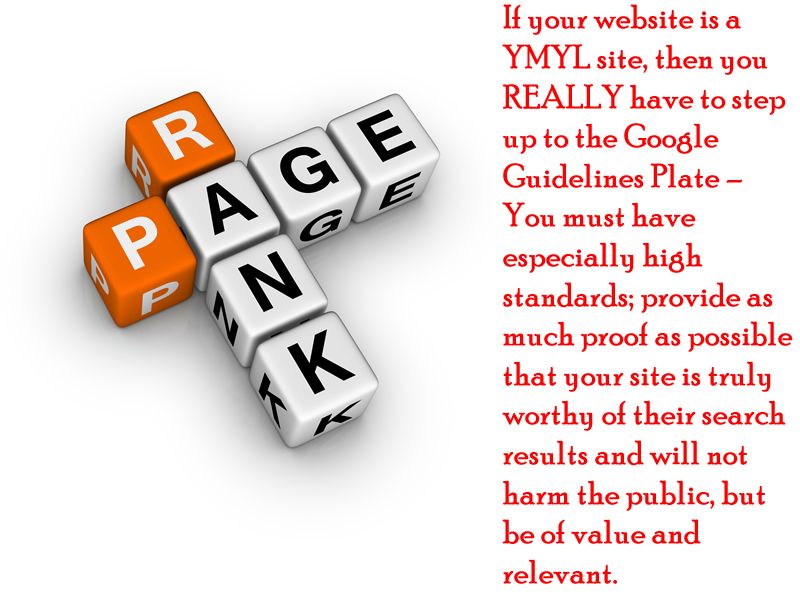 Finally, You Can Now Easily Appease Google’s Guidelines, Get Ranked & Stay Ranked! With the YMYL Footer Plugin, you will finally be able to leverage any Google up-to-date content requirements in their page ranking database to help with your marketing efforts! Get a leading edge on the PR Index!! With WordPress and the YMYL Premium Footer Plugin, you will never again have to struggle with authenticating copyrighted content for your Websites. And remember, copyrighted content impresses users which in turn impresses Google. With the YMYL Footer Plugin, you’ll get an instantly higher ranking by Google for meeting their guidelines regarding proof of Authority and Expertise. This Plugin adds a Copyright Year and Copyright Notice Page link which is automatically updated to the year on your system. 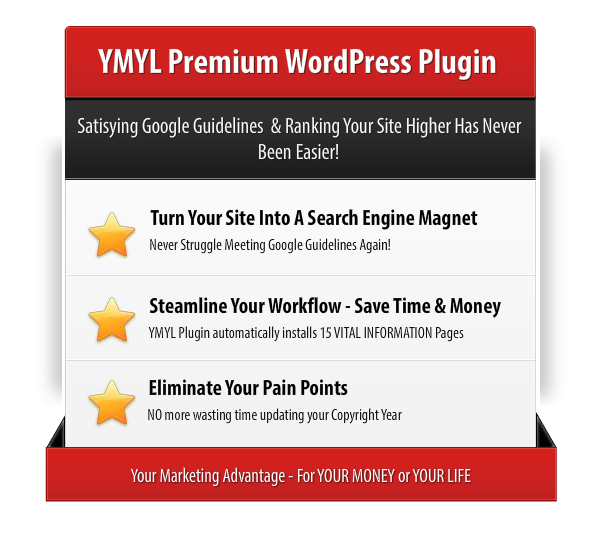 The YMYL Plugin provides Authority SEO. No more spending countless hours updating your Copyright year when the New Year changes. When websites are evaluated by Search Engines, they first look for up-to-date content by checking the Copyright date. If your site’s Copyright is not current or perhaps missing all together, Google will totally discredit your site with an unsatisfactory rating. 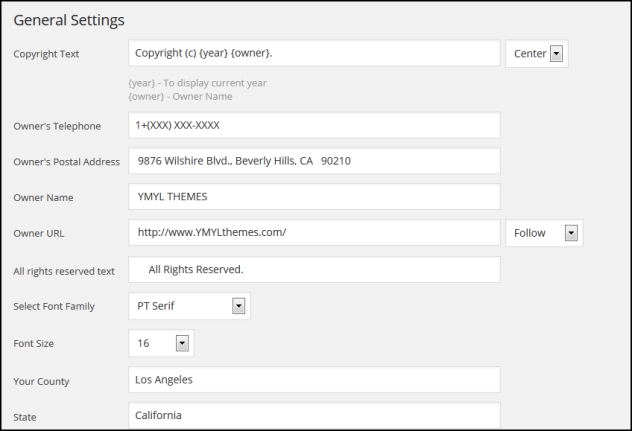 YMYL installs your current Copyright Date and automatically updates it to the next year. Perhaps you already know — a smart robots.txt and an XML sitemap is an absolute must-have for any website (and especially now, with Google getting ever more persistent about quality site content). And YMYL Plugin totally takes off your shoulders the irksome tasks of creating and managing the robots.txt file and XML sitemap for your site! Set robots.txt rules to specify how search engines should crawl your content and build Google XML Sitemaps to boost your site’s indexation in just a few clicks of a mouse. But what goes in that robots.txt file? YMYL Plugin has that covered for you! YMYL Plugin automatically installs a protective Robots Text file, which is completely editable according to your own specifications if you want to. The instructions to the Sitemap are given to the crawler bot by a Robots Text file. Easily improve your Site Optimization and earn Google Respect by adding a Sitemap to your site automatically with the YMYL Premium WordPress Plugin! Once your website is evaluated for its main content quality, relevancy, and usefulness, your site is next evaluated for its Contact Information. Google wants LOTS of Contact Information! They want to make sure your site has been created with the necessary Authority and Expertise. 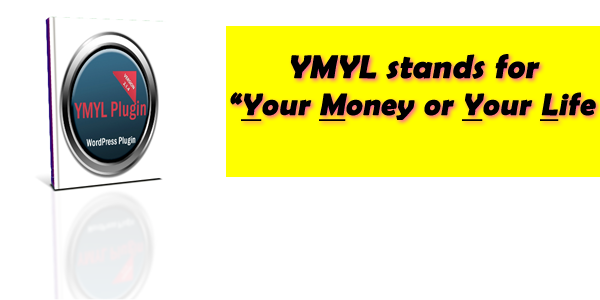 YMYL stands for “Your Money or Your Life”. Search Engine Evaluators use this phrase (YMYL) to rate Websites that can have an impact on your current or future well being (Physical, Financial, Safety, etc.). Search Engines expect that YMYL pages should come from reputable websites and the content should be created with a high level of Expertise and Authority. * Pages that solicit personal information, such as personal identification numbers, bank account numbers, drivers license numbers, etc., which could be used for identify theft. * Pages used for monetary transactions, on which users might give their credit account or bank account information; for example any page that allows you to buy something. * Pages that offer medical or health information that could impact your physical well being. * Pages offering advice on major life decisions, such as pages on parenting, purchasing a home, a vehicle, etc. Understanding how other successful marketers are optimizing their sites simply by following Google’s Guidelines will give you an incredible LEADING Edge over your competition. Show authorship/ownership of your site with IMPORTANT INFORMATION. Automatically install ALL your Contact and Legal pages. Automatically install your Robots Text file & Sitemap file. Menu driven creation and management of Contact and Legal pages. Sitemap -SITEMAPS – Don’t leave indexing to chance…use a Sitemap! The only way Google crawls things is through site links – the reason your Sitemap should be found in your site’s footer…on every single page. Stay out of the Google sandbox with automated copyright updates. Search engines place great page ranking value on original, useful, relevant, and up-to-date content, especially if the page content is associated with the author/publisher. The YMYL Premium Footer Plugin adds a Copyright Year and Copyright Notice Page link on your footer, which are automatically updated to the year on your system. No more spending countless hours updating your Copyright year when the New Year changes. Choose from 18 of the most popular Google fonts (another SEO benefit) and 6 font sizes. 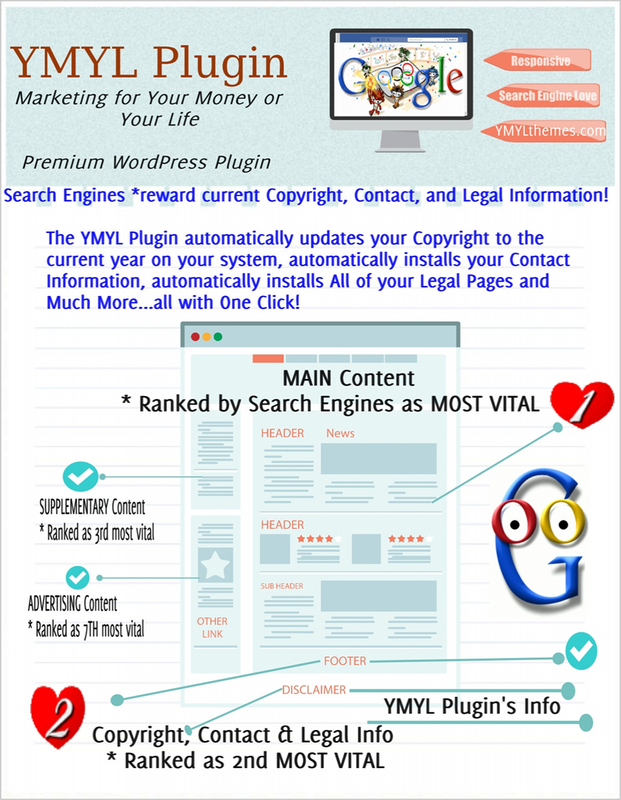 YMYL Plugin creates a Copyright Year, Copyright Notice, and a series of 14 VITAL Information and Legal Pages at the Footer of your WordPress Site. This footer lets you meet Google Quality Guidelines for VITAL Information, allows you to customize it exactly the way you’d like, and saves you tons of time without knowing any coding. First, you place the footer plugin shortcode into your theme, which loads asynchronous to keep your website speed! Then you activate and enter your personalized information in the Plugin Settings Admin area, which automatically populates your specific information into all the pre-loaded pages. Each of the 14 pre-loaded pages can be used at your discretion and edited if you choose to do so. 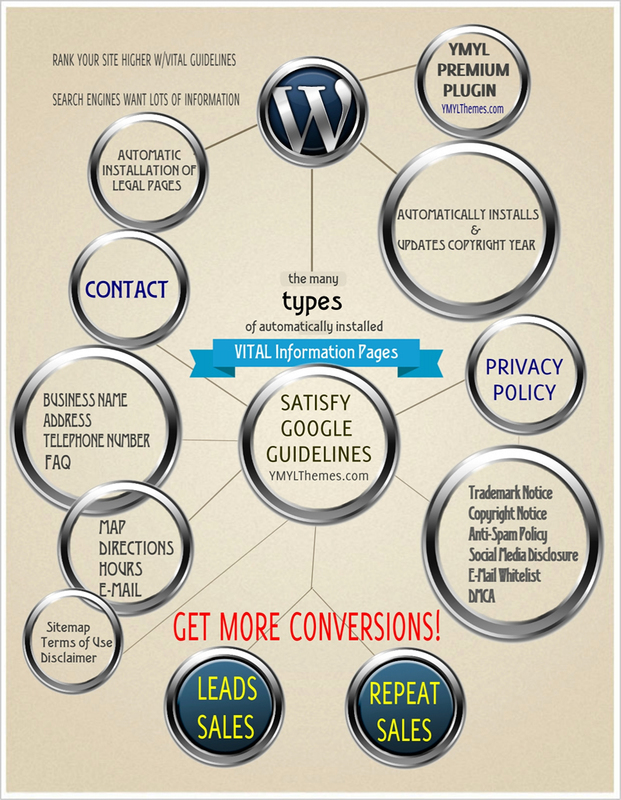 You can easily improve your SEO with No Follow/Follow options. YMYL Plugin also creates a Sitemaps Page with a link on your site’s Footer and gives you a Robots text file, which helps secure your site. Bonus: Unlike other WordPress Plugins, this one helps you comply with Search Engine Guidelines, automatically updates the Copyright Year according to the year on your server, and instantly personalizes your VITAL Information Pages. You’ll never have to spend endless hours updating the Copyright Year on your sites again. Choose from 18 of the most popular Google fonts to gain an additional SEO benefit. 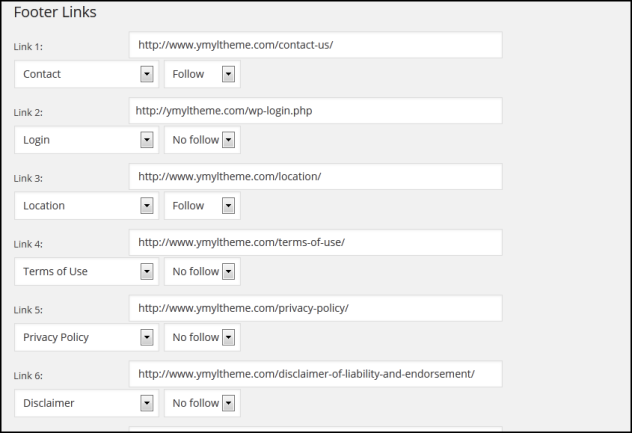 YMYL Plugin utilizes a theme shortcode to load asynchronously, so it does not inhibit your website speed! Automatically adds your Copyright Notice to the footer of your WordPress site. Automatically updates the current year in the Copyright date. You have the option of making the Copyright owner link as NoFollow. Along with Copyright notice, you can add your own Links for which there are options in the Plugin settings. These additional links can also be made as NoFollow. Includes a Copyright statement that updates automatically when the year changes – an out of date Copyright is a nullifying signal to Google. Includes your telephone number to prove you are a genuine business. Includes a mailing address and map to prove you are a genuine business. Supports both a single line centered footer and a multi-line right or left aligned footer. The Plugin hook allows you to add the footer in just the right place on all WordPress themes. Demo content included for all 14 auto-loaded Vital Information Pages. 1. Installs a Sitemap page and option to customize. 2. Installs a robots.txt file w/customizable preferences. 3. Installs an automatically updating COPYRIGHT Year. 4. Installs a customizable COPYRIGHT INFO PAGE w/link. 5. Installs 14 customizable VITAL CONTENT pages. 6. Select from 18 Popular Google Fonts. 7. Select one of 6 Font Sizes. Your YMYL Plugin will be Available Immediately After Payment Has Been Received. That’s what Google is telling us more and more. In other words, if Google doesn’t think your Site is credible, they want your money (from buying adwords) to get on their Search Results. Through the correct implementation of the Google authorship proof footer link provided with YMYL Plugin, authors have the opportunity to increase the visibility of their pages in search results and benefit from an increased click-through rate, particularly if they are highly regarded industry experts. They want sites that can prove their value. So what is this value? Lots of original content pages? 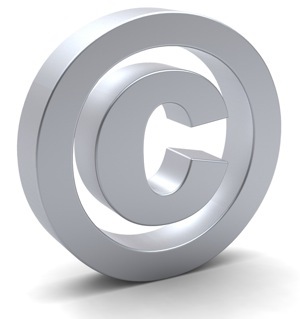 In fact, the Most Important Value you can have on your Website is Copyrighted Content! Google considers up-to-date content to be high quality content, especially up-to-date content from a verifiable Author, Expert, Business or Webmaster. Regularly placing up-to-date content on your Site will increase your Website’s exposure and help raise your rankings! Placing lots of Contact Information, along with a current Copyright Date and Notice will increase your Site’s Rankings even more!! Google Doesn’t Want Scammers On Their Search Results! One of the reasons Google is constantly switching things up is because they realize people no longer place any real value on duplicate content affiliate sites, poorly done squeeze pages or sales pages. Because the Internet has grown so huge, scammers abound everywhere and you need to prove yourself otherwise. You need to protect your online business! Customers love to buy and they love to buy from those who help them out and provide a great product. However, the sites that show up first on Google Search are primarily sites that prove their authorship. They want authentic content and they want to see you prove it! What’s the best content? Copyrighted. An Up-to-date Copyright Notice provides proof to your site visitors that your content is current and in turn, Google then likes your page and gives you more traffic. Current Copyright increases the likelihood of someone taking your site seriously. You Need Copyrighted Content & VITAL Information Pages On Your Site! Of course, you’ve already been doing that, right? Yeah well, Google sees how many sites are clearly missing the mark. Losing Google Rankings and Traffic! 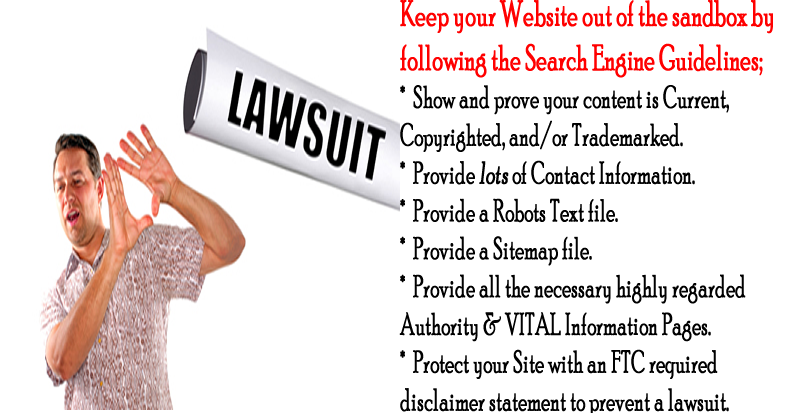 Your Site Has No Current Copyright or No Optimized VITAL Information Pages! Seamlessly integrates with WordPress – just install shortcode hook, upload and activate! Automatically installs a Complete Footer w/Page Links. Automatically adds your Copyright Date & Notice to the footer of your WordPress site. Automatically updates the current year for the Copyright date. Along with Copyright notice you can add your own Links for which there are options in the Plugin settings. These additional links can also be made as NoFollow. Includes a Copyright date that updates automatically when the year changes – an out of date Copyright is a nullifying signal to Google. Includes a telephone number to prove you are a genuine business. The Plugin’s hook shortcode allows you to add the footer on all WordPress themes. Admin Options for all links in the footer setup are created to enhance best SEO recommendations. Pre-loaded content included for all 14 auto-loaded Vital Information Pages. Admin selection of 18 Popular Google Fonts to boost SEO. Plugin loads asynchronous with your theme to keep your website speed! Its a Simple As Inputting Your Custom Information! Never Struggle with Google Slaps Again! As you can see, this Incredible Plugin will make your life, your customer’s and your Website’s life, much much easier. More Google Love. Higher Rankings. Boost SEO w/Popular Google Fonts. Save Time w/14 Auto-Install Pages. You’re Marketing For Your Money or Your Life! This Plugin will help save you loads of time (by appeasing Google Guidelines and auto-installing 14 Pages) and help get you more traffic and make you more money. We are so confident that you will be happy with your purchase that you get our 100% Money back Guarantee. If it is not absolutely everything we claim it to be…send us an immediate Email and we will give you a prompt, no-hassle, no-questions asked 100% refund. There are no catches to this offer. There is no fine print. Simply order YMYL Plugin, use it for 30 days and if you aren’t totally impressed by it just return it for a No Questions Asked, No Hassle Refund. We implicitly reserve the right to remove this offer at any time WITHOUT notification. Due to the high demand for YMYL Premium Plugin, we reserve the right to remove, raise the price, or close this offer down completely. Once this offer is removed, it is gone for good. Click the order button to get started today and start getting the rankings you and your customers deserve. You will be redirected to our secure order form to process your transaction and in just a few short minutes you will get your instant access to the YMYL Premium Footer Plugin.